This article is about the special move. For the Wario Land II enemy of the same name, see Punch (enemy). Punching is an attack that most characters can do in the Mario franchise. The punch move is first seen in Super Mario RPG: Legend of the Seven Stars, as Mario's attack move to defeat enemies and bosses when he is unarmed or when he is equipped with either the Punch Glove or Mega Glove. It is more famously seen in Super Mario 64, in which it is Mario's basic attack; he will kick instead if he punches two times in a row prior, or if he's in midair; Luigi and Wario can also use punches in the remake, Super Mario 64 DS. Most characters have punch moves in the Super Smash Bros. series. In most cases these moves are standard, tilt, or smash attacks, though some, such as Captain Falcon's Falcon Punch or Donkey Kong's Giant Punch, are special moves. Various Mario Party minigames involve punching objects or other players. Some characters have alternate animations for their punch, most noticeably Peach and Daisy, who have an open-hand slap instead. Yoshi uses a headbutt in the Nintendo 64 Mario Party games, but it was changed to a punch in all later installments. Birdo also has a slapping animation similar to Peach and Daisy in Mario Party 7, but it was also changed to a punch in Mario Party 8. In Super Mario Party Goomba headbutts due to having no arms. In Wario World, Wario punches when the player presses the Button. By holding the Button down, a punch followed by a Dash Attack will occur. While beating up an enemy or a group of enemies, every third punch will be a headbutt, which is three times as strong as a punch. In Mario & Luigi: Bowser's Inside Story and its 3DS remake, Bowser's move is punching; in battle, he winds up a punch that can be executed with the X button, and on the overworld he can punch obstacles and later gains the sliding punch. Bowser also punches as one of his attacks as a boss in both Mario & Luigi: Dream Team and Super Mario Galaxy 2. 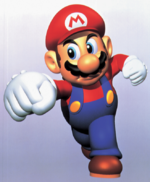 In earlier builds of New Super Mario Bros., Mario was shown to be able to punch by pressing the button, along with other moves generally based off of Super Mario 64 and its remake. It was completely removed from the final game. This page was last edited on November 18, 2018, at 15:09.